In a recent post, I talked about why internal links and hub pages are a vital factor for SEO, as this helps avoid the problem of pages on the same site ‘cannibalising’ each other’s search rankings. In this article, i’ll look at how cannibalisation and semantic flux are affecting search rankings for separate, but related sites. The examples I use here are PC World/Currys and Tescobank/Tescocompare. Each brand is cannibalising its own rankings in different ways. These two sites are owned by Dixons Carphone and there is an overlap between the products stocked by the two retailers. Offline, many of the stores seem to have blended together, but online they are still two separate websites, with exactly the same design. Currys leans more towards kitchen appliances etc, and PC World towards computing, but both sell laptops, PCs, tablets and TVs. And they are cannibalising each other in Google for these product terms. 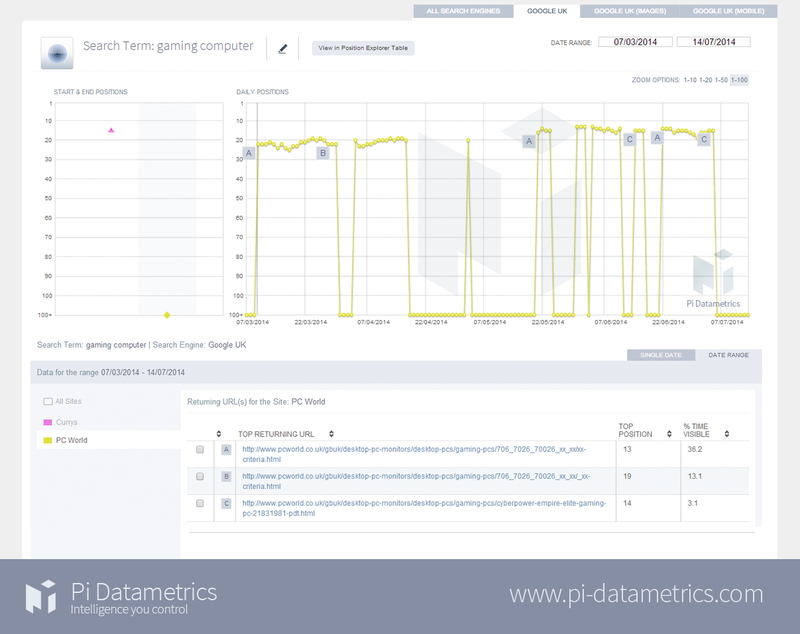 This chart, provided by PI Datametrics, shows the two sites’ Google rankings for the term ‘gaming computer’ between March and July this year. In this example the two are obviously swapping places. Google can’t decide which site should perform for this term and gives credit to one site for a few days, then flips to the other. We call this The Semantic Flux. Presumably one site is just looking at its own positions in isolation, and therefore can not see this relationship that Google has placed on it. Here’s the same chart just showing Currys’ stats. Its SEO team must be wondering what’s going on. Indeed such fluctuations may set alarms bells ringing over possible penalties. You can see the same pattern on PC World. It ranks on page two or three, then vanishes from the SERPs for weeks at a time. And PC World’s gaming PC page. The only difference seems to be that there’s an ad for personal loans on this one. The products, descriptions, page layouts etc are all the same. So, we have two separate sites, owned by the same company but selling the same products on pages which are almost exactly the same. No wonder Google doesn’t know which one should rank. In a nutshell, Dixons Carphone needs to favour one site over the other as the current situation isn’t helping. Decide which doorway you want to present in the SERPS for key products and services and optimise these pages uniquely and appropriately. If there are two sites involved the same applies. 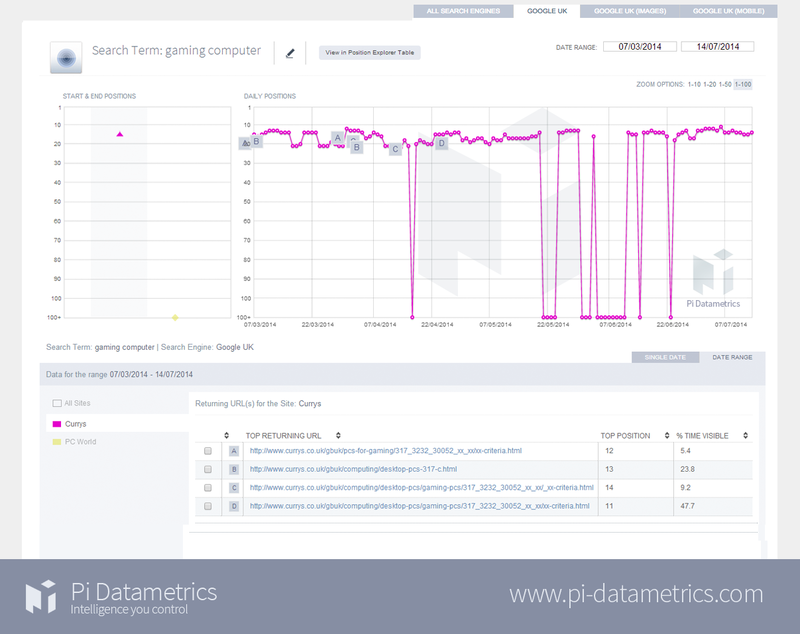 Additionally, if flux is likely then provide clear migratory pathways between domains for searchers so if they have come in through, in this case, Dixons Carphone’s ‘wrong door’ due to SERPS changes then they can easily migrate to a different part of that world. These two sites need to think of the bigger picture, i.e. Dixons Carphone’s bottom line. Semantic flux can, as we have seen numerous times with other forms of cannibalisation, lead to both domains losing out to competitors. 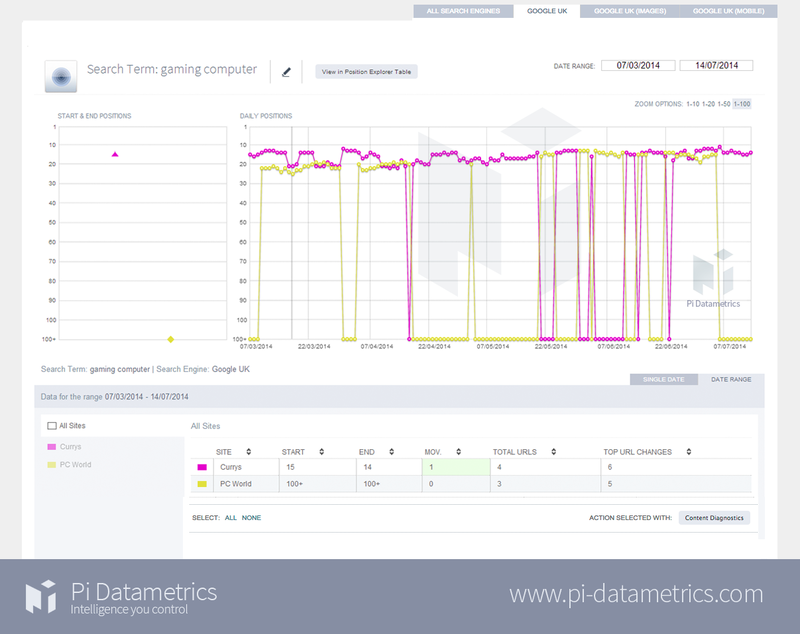 So, decide a SERPS winner by category or service, theme, optimise, connect and monitor both position and searcher behaviour. So, the answer would seem to be either merging the two sites or to avoid duplication of products between the two retailers. Maybe Currys should leave computing to PC World. This isn’t quite the same as the Currys/PC World example, as the sites seem to be sharing the same rankings. However, they’re both down on page four and below, so perhaps they are bringing each other down. 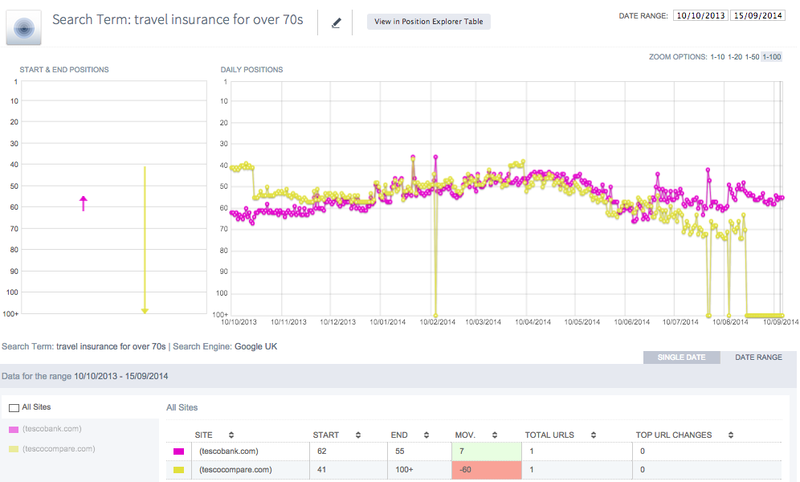 The chart shows ranking changes for the search term ‘travel insurance over 70s’. There are different types of Semantic Flux. 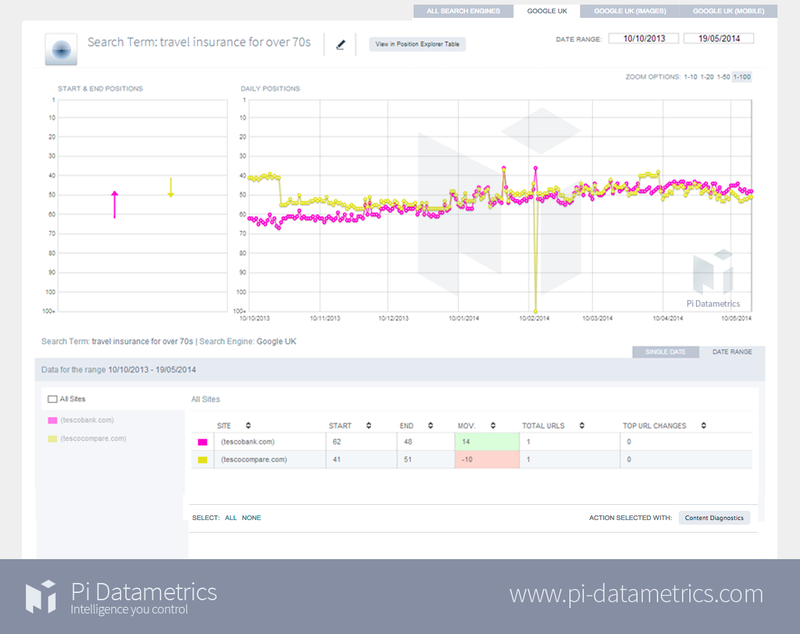 Here we see almost exactly the same performance from both sites, where they have come together in the SERPs and dance together, they seem to be inseparable. This could be quite an interesting case study, as Tesco closed its Tescocompare site on August 29, leaving the field open for Tescobank. You might think that, without the confusion caused by its ‘sister’ site, Tescobank might rank higher, or at least more consistently. Perhaps it’s early days yet, as it is currently at the top of page six for the term. The updated chart shows that Tescocompare has now dropped out, and Tescobank is currently a little higher than its average ranking over the year. Perhaps it might take time to benefit from the removal of the conflict between the sites. Still, Tesco may have found the solution to its ranking problem here, even if this wasn’t the reason it closed the comparison site. Comparison sites are very much an SEO play and, though Tesco would have been able to promote it through other channels, the fact that it was failing to catch enough search traffic may have led to its closure. Whatever the reasons, the lesson here is that Google is able to spot a relationship between the brands, whether manually or not, and companies with multiple sites cannot expect to duplicate content, site structure etc and retain search rankings. In the next post I’ll look at the relationship between RBS and Natwest, two brands owned by RBS Group, and how their are damaging each other’s SEO strategies.